Steve Gray, with Jeff Lukas and Connie Woodhouse, used a network of existing tree-ring chronologies generate streamflow reconstructions for the White River, the Yampa River, and the Little Snake River, the main tributary to the Yampa (Gray et al. 2011). The Yampa River near Maybell, CO gage, represents the flow of the Yampa River just above where the Little Snake River joins it. Figure 2. Observed (black) and reconstructed (blue) annual Yampa River annual flow, 1906-2002. The observed mean is shown by the dashed line. Figure 3. Reconstructed annual flow for the Yampa River (1000-2002) is shown in blue. Observed flow is shown in gray and the long-term reconstructed mean is shown by the dashed line. Figure 4. 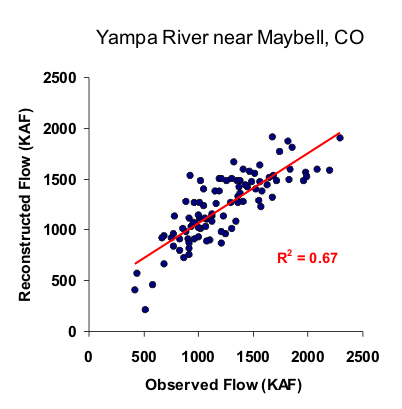 The 10-year running mean (plotted on final year) of reconstructed annual flow for the Yampa River, 1000-2002. Reconstructed values are shown in blue and observed values are shown in gray. The long-term reconstructed mean is shown by the dashed line.